Solar irradiation provides light, heat and energy for driving atmospheric motion on Earth, and is directly affected by solar activities. The Fifth Assessment Report of the Intergovernmental Panel on Climate Change (IPCC) indicated that solar activities have significant effects on the climate system, but large uncertainties also exist. The related mechanisms, especially how solar activities affect East Asian climate, are still unclear and need further investigation. PhD. student Jiapeng MIAO, Associate Professor Tao WANG, and coauthors, from the Institute of Atmospheric Physics, Chinese Academy of Sciences, used a four-member ensemble of 600-year simulations and observational data to examine the influence of low-frequency solar forcing on the East Asian winter monsoon (EAWM). Their results, published in Advances in Atmospheric Sciences, show that the EAWM is strengthened when total solar irradiance (TSI) increases on the multidecadal time scale. Specifically, the Siberian high and low-level East Asian winter circulation are strengthened, and the surface air temperature in East Asia decreases significantly. Additionally, the team further investigated the potential dynamics and mechanisms behind the EAWM's response. 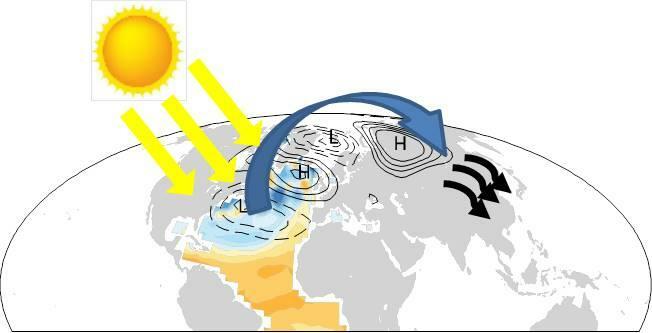 Jiapeng MIAO explains their findings: "The model results indicate that positive TSI anomalies can result in a weakening of the Atlantic meridional overturning circulation, causing negative SST [sea surface temperature] anomalies in the North Atlantic. Especially for the subtropical North Atlantic, the negative SST anomalies can excite an anomalous Rossby wave train that moves from the subtropical North Atlantic to the Greenland Sea and finally to Siberia. The wave train can reach the Siberian region and strengthen the Siberian high. As a result, low-level East Asian winter circulation is strengthened and the surface air temperature in East Asia decreases. Overall, on the multidecadal time scale, when solar forcing is stronger, the EAWM is typically stronger than normal." They also found a similar phenomenon in observations. The results are helpful for better understanding the mechanisms underlying the variability of the EAWM at the decadal and longer time scales.